Does your Radiator look like this? 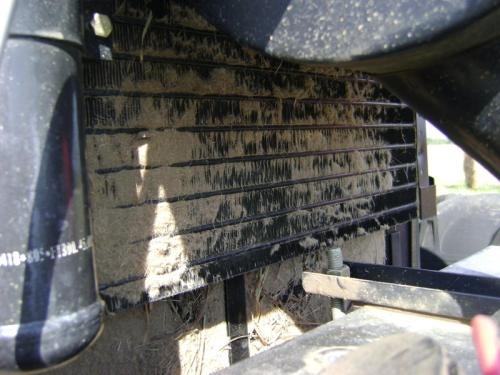 Are you having clogged radiator problems, Overheating issues which could lead to premature engine failure? If so then the Radiator Genie is for YOU! Call our toll free number to order yours today! We are the B.C. Dealer for the Radiator Genie. The Radiator Genie is an invaluable tool to keep all your equipment running smoothly. Tractors are loyal servants. Still, they cannot overcome the misguided operating skills of their owners. Their rush to finish a job and their firm belief that warning lights are only advisory, can bring even the finest piece of machinery to its knees. 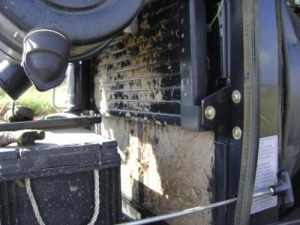 One of the TOP 10 WAYS TO RUIN YOUR TRACTOR is failing to keep the radiator clean. It is not rare for an engine to burn up due to dirt/debris clogging the radiator fins. SOLUTION: If your engine registers hot or the radiator is visibly clogged, do what the service techs do in the shop: blow and/or wash the dirt from the radiator. The heart of any engine is the cooling system. When working in dry, dusty and dirty conditions your radiator will plug up with debris. It needs to be cleaned at least once/day and up to 5 times/day depending upon working conditions. The only tool specifically designed to solve this problem is the Radiator Genie. It has the right size tubing for tight places and a specially designed fan head for increased pressure to cover a wide working area. The bend on the Radiator Genie is designed to fit into your engine's cowl, between the fan blades and to be at the correct angle to blow directly through the radiator coils and to exert maximum pressure to the back side of the radiator. Last but not least, the pressure is adjustable on both the air and water wands so you can BLOW out or WASH out debris to make your radiator as clean as new! Use the ONE and ONLY specially designed and patented Radiator Genie for all your radiator cleaning needs!